The first time I set foot in chef John Gorham's home kitchen was right before Christmas 2011, when offers were starting to come in for the "Toro Bravo Cookbook" (due out from McSweeney's this fall). John, his wife, Renee, and I sat at the 10-foot-long Virginia pine kitchen table and discussed publishing houses and deals. I remember thinking, this is a pretty small kitchen for such a big man and prominent chef, who owns three of Portland's most talked-about restaurants: Toro Bravo, Tasty N Sons and downtown's new Tasty N Alder. The 250-square-foot kitchen in John's lower Willamette Heights, 1960s split-level ranch is teensy - the size of a typical apartment kitchen. But chefs learn quickly how to make the best use of kitchen space, and Gorham's kitchen is a prime example of efficiency and practicality. Even his backyard fire pit is located just steps away from the kitchen door, making it easy to use as a secondary cooking source. 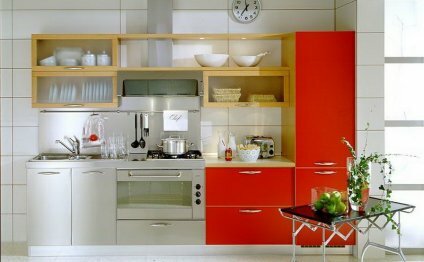 "Just because you have a small space doesn't mean you can't make a kitchen that works well, " Gorham says. "Honestly, I think kitchens that are tight with close counters are often the ones that work the best. My kitchen functions really well." I can personally attest to that. As his cookbook co-author, I spent a good deal of time testing recipes in that kitchen last spring and summer. It never felt too crowded even when three people were testing at once. "When we found our house there were lots of small rooms, which is typical of split-level ranches, " Gorham says. "We wanted an open feel to the kitchen and living room, especially since there wasn't a lot of natural light in the kitchen." So he got rid of the wall between the kitchen and living room and put a butcher-block counter in its place. This gave him more prep space, and he was able to jettison the bulky fridge and tuck two restaurant-style reach-in refrigerators underneath. Another space-saving solution: no vent hood. It's the fan that does the work anyway, so he inset an exhaust fan above the stove and hung pots on racks around it. While open shelving takes up most of the vertical space in Gorham's modern-leaning kitchen, there's one standout piece that does double duty as functional wall art: an antique leather butcher belt kitted out with a wood and steel knife case. Able to hold eight to 10 knives, the belt belonged to his 8-year-old daughter Ruby's great-grandfather, who was a butcher in Germany. When Gorham traveled there in 2007, Ruby's great-grandmother gave him the belt to keep safe until Ruby is old enough to appreciate it. That's a relic that he's more than happy to make space for in his kitchen.